It's Dolly Parton's world and we're all just living in it. The 73-year-old multi-hyphenate who has been honored with numerous awards and titles was named the MusicCares person of the year. At the ceremony, a number of singers sang her famous songs, including Miley Cyrus and Shawn Mendes, and Parton told Ryan Seacrest she "had such a wonderful time hearing all these people sing my songs." 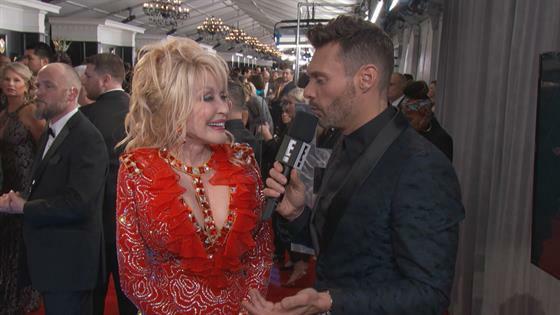 "It's so exciting," Parton said at the 2019 Grammys. The big surprise for her at MusicCares came when Linda Ronstadt and Emmylou Harris surprised Parton at the ceremony. The three previously collaborated in the 1980s with Trio. With the MusicCares honor, numerous hall of fame inductions, nine Grammys and numerous other special awards, Parton said they're all important and "they built a wonder life for me." However, the one that really stands out, she said, is becoming a member of the Grand Ole Opry, because it was something she dreamed about as a young child. Now, she's got Dollywood, her own theme park, two Oscar nominations, six Golden Globes nominations and so much more. So, does she wake up still content with being Dolly Parton? "I get up every day with new dreams and I know I have work to do…I've dreamed myself into a corner, so I've got to be responsible for all of that," Parton said.